What wonderful friends we have at Granite Springs Farm! Despite temperatures scaling above 100 degrees, we had an influx of friends join us on the farm this morning to get everything harvested as swiftly as possible. By 10:30am, we were at least shaded under a shed cleaning up garlic, beets, and onions. A BIG heartfelt thank you to all that showed up and made our harvest such a delight and a great deal cooler. Another big thanks goes to Roberson Creek Farm of Moncure, NC for supplying sweet corn for our CSA peeps this weekend. Heads up: because they do not spray their corn – which we are grateful for – we snipped off the ends where a few creatures found their way in. Although the recent Summer Solstice marked the official first day of summer, we at Granite Springs Farm have a number of other sensory observations that remind us summer has bulldozed its way in .90+ degree heat blankets our fields with undeniable weight. Water breaks (for drinking and rinsing; for the humans and the plants) are essential. Critters and pests emerge where we wish to not find them, hoping to grab the same snack we want to share with you! And what you’ll find in your bag, dear CSA peeps, is as good as any calendar announcing the start of sweet summer. 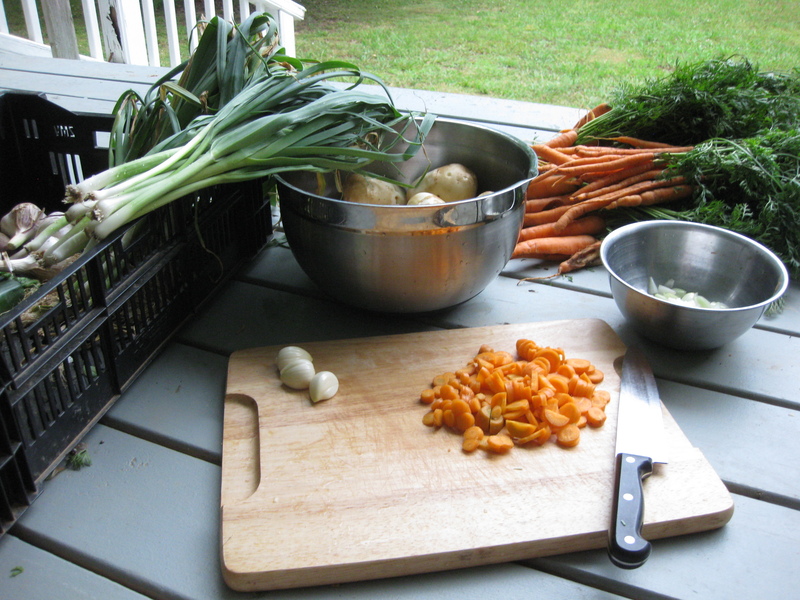 Today’s harvest ended with a delicious bowl of our bounty a la Potato Leek Carrot Soup! We recommend you try it too. (recipe adapted from leekpotatosoup.com). Add the olive oil to a frying pan at medium heat. Add to the oil leeks, onions, carrots, and celery. Stir until onions have sweated and carrots just begin to tenderize. Preheat the vegetable stock in a large pot until the stock begins to boil. Add to the stock potatoes, garlic, and the vegetable mix. Simmer all ingredients until the carrots and potatoes are soft. Provide chopped fresh parsley to top each served bowl. Update: Day 2 we drained off a bit of the liquid and whirred this around in the food processor with some milk making a creamy soup. Delicious! We’ve been enjoying a great, refreshing dip with all of our cucumbers. It is a perfect addition to the next potluck! Combine cukes and onion in food processor, then drain and put back in processor with remaining ingredients until well blended. Great on crackers or bread!